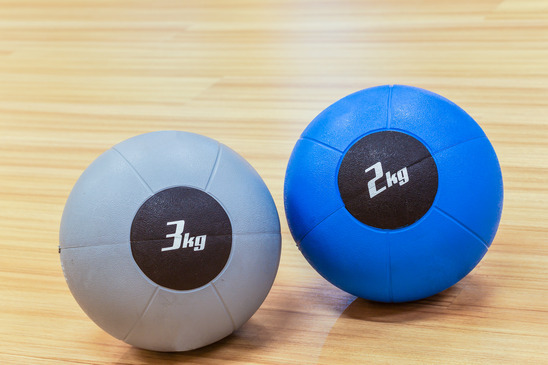 Often mistaken for Swiss balls, medicine balls are smaller and heavier. They have a size similar to a soccer or basketball, and often come with handles. Sometimes they are filled with rice or sand and can be used as a great tool for core stability, and overall strength from head to toe. Are you up to date on your medicine exercises? If not, there’s no time quite like the present to lunge, throw and twist. Here’s how to do it right! When you want to improve not only your glutes and thigh muscles, but you’re overall endurance, add the lunge and twist to your weekly workout! Consider this exercise just like the traditional lunge (starting with standing with feet shoulder width apart, and then taking a step forward with your right leg). With your right leg bent (ensuring your knee isn’t bent over your toes) and holding onto your medicine ball with arms extended out, pause. Twist your torso to the right, to the left and back to the center again. Then, come back to a standing position, and lunge forward with your left foot. Repeat. Your next step will be to jump as high as you can, followed by throwing your medicine ball up as high as you can. Just be sure to get out of your own way—because that ball will come flying back down in just a second! Repeat. Do you want to improve the overall strength and look of your shoulders, and chest? This push-up exercise should do it! Start in a traditional push-up stance (palms on the ground, back straight). Once you’re in a high plank position, place the medicine ball in one hand, while the other is firmly planted on the ground. Rotate the ball (from right hand to left hand) with each push-up. Working with a medicine ball is the perfect way to target your desired muscle groups, and strengthen your core. Raise your metabolism, minimize your stress and boost your confidence with these exercises! It’s a win/win for your body and mind!